Kittens, meet my white whale. 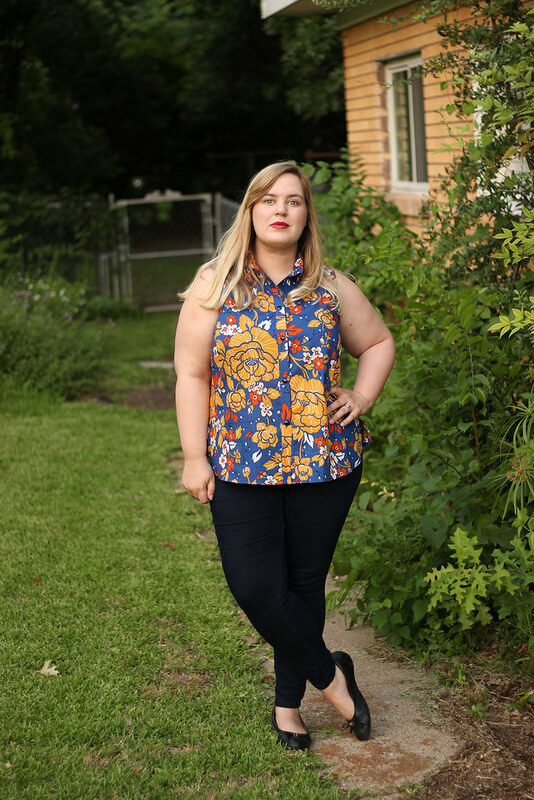 For the entirety of my adult sewing career, I have longed for the perfect button-front shirt. This is, obviously, a running theme with me. I believe in the platonic version of every garment. It's the entire reason I picked up sewing again, as an adult. I wouldn't just go shopping for a cute sundress, I would go shopping for the perfect sundress. Inevitably, I'd mentally design a garment in such specific detail that it became impossible to find in stores. The color wouldn't be quite right or the cut would be wrong. Given my proportions, even if I did find my perfect piece, it rarely fit. Buttoned shirts were the worst. If they fit my bust, the sleeves, shoulders, and waist were comically large. I ended up looking like a toddler wearing her dad's work shirt. Unfortunately, this hasn't improved much with sewing. 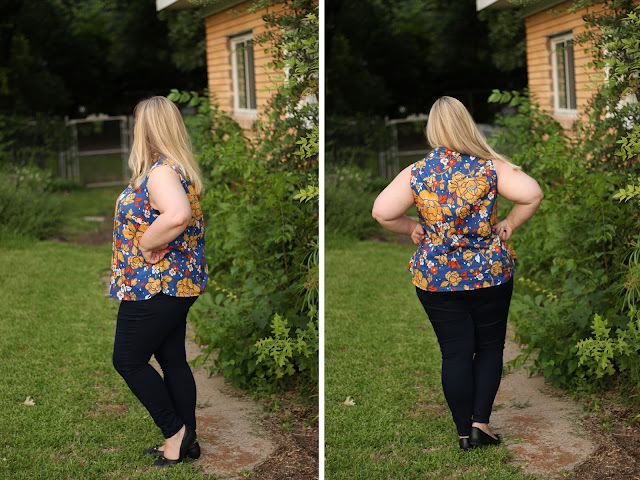 Grainline's Archer shirt, which worked beautifully on some of my favorite bloggers*, was all wrong for me. Even after adding a dart, the style was too boxy, losing my shape in swaths of fabric. I muslined Sewaholic's Granville, but at the end of the day, it took too many alterations to make a pear-specific pattern work for me. 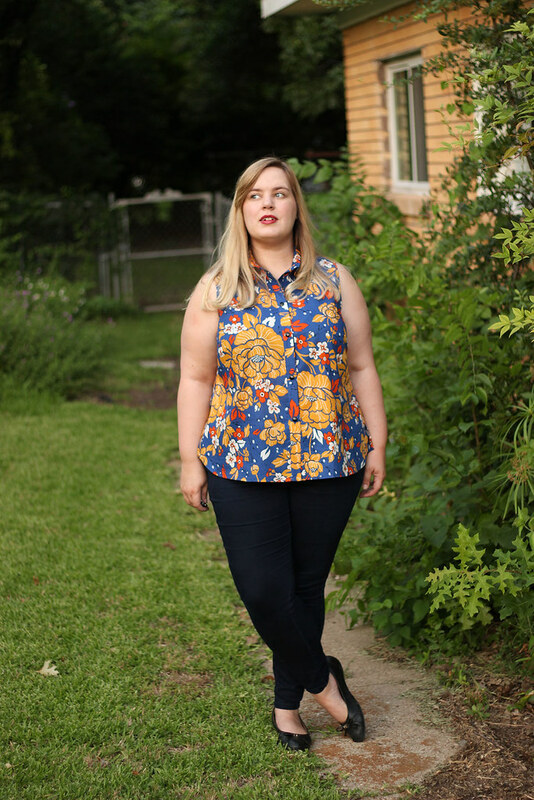 Most Big 4 options lacked my favorite details, Deer & Doe's patterns didn't come in my size, and Burda's plus size shirts gave billowy a new name. Admittedly, I could've just drafted one from my sloper or made 800 alterations to any of the above patterns. Alas, I'm lazy and wear dresses most of the time anyway. Every so often I would try out a new button-front pattern, be nonplussed by the results, and dive back into the safety of floofy dresses. Unlike my more desultory attempts at button-front shirts, this time I had both gumption and a plan. 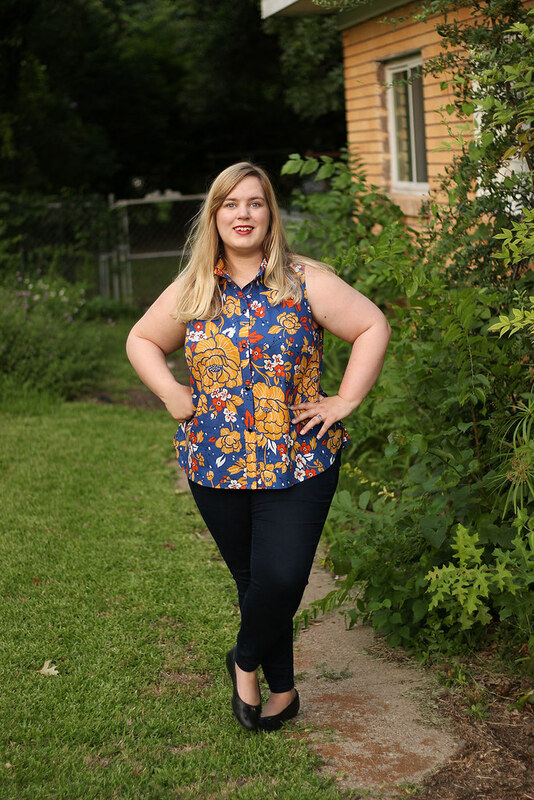 Instead of using an existing shirt pattern and tweaking it to high heaven, I took McCall's 7351 and turned it into my go-to button-front blouse. The bodice already worked brilliantly as a shirtdress, with a nicely fitting collar and gape-free button band, so it was a cinch to translate those features to a shirt. Lengthened the back and front bodice pieces to my fullest hip point + 5/8 inch for a hem. This erased my added waist dart and added eight inches to the bodice pattern. On the back, this also straightened the sharp curve inward at the waist. Lengthened the button bands to match the bodice. Flared out the hip curves, to put a little swing in the blouse. Added a split at the side seam, for ease of movement. Curved the final hems into a shirt-tail shape. Voila! My platonic shirt pattern materialized. 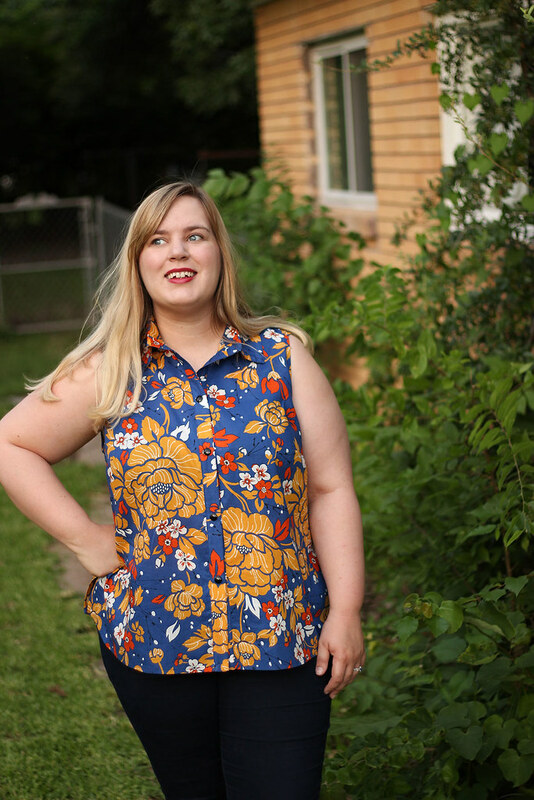 The fabric for this first blouse is an Italian cotton batiste from Mood, bought as part of my monthly Mood Sewing Network allowance, in a riotous floral print. I love all those hot colors on the bright blue background, though this fabric also comes in a dishy fig/light pink/light blue colorway and an autumnal orange/yellow/black colorway. 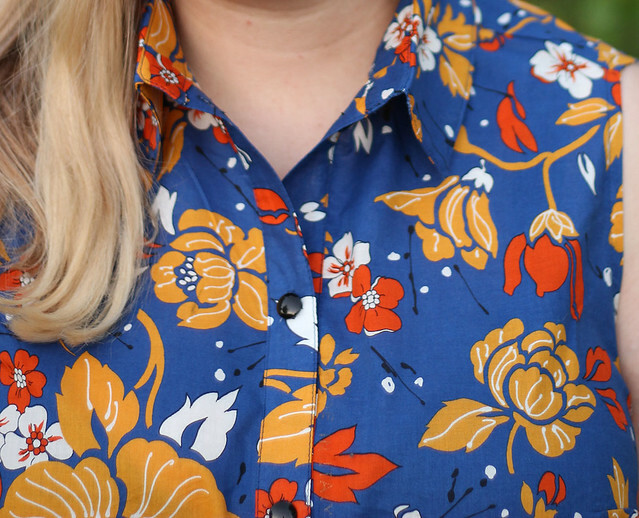 I figured that the tailored lines of my blouse would be a good match for such a large scale print, since the top-stitching and details break up the gigantic flowers. It doesn't overwhelm my figure, as it might made into a dress, but instead is a nice, bright summery piece. 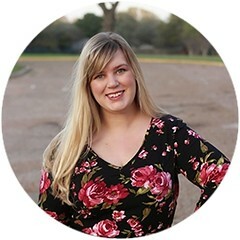 The construction details are a hodgepodge of my favorite shirtdress and flowy blouse techniques. Collar, collar bands, and button bands are all interfaced with fusible interfacing and sewn by machine, while the armscyes and yoke are finished with self-fabric. There's matching blue top-stitching all over the place, including the side seams, which are turned under and stitched. Black buttons finish it off, further grounding the loud print. The back is a bit blousy, so I may add some very small double-ended darts there in its next iteration. Y'all, I love this blouse. Love, love, love it. I want to wear it everyday and dance around and tell complete strangers that I made it myself. So, I'd call this experiment a win. It hugs my body in just the right places, moves really well, and isn't drowning my figure in fabric. To prevent it falling apart at the seams from overuse, I am going to make a few more in fabrics picked up on our eastbound adventures. I have a white and black polka dot shirting that would be so sweet in this pattern, with little black buttons marching up the band. Also, thank you so much for all your kind words, last week. June is definitely a better month than May, around here. Sam is hale and hearty, our house has yet to explode again, and I'm spending an inordinate amount of time in my sewing room. Summer is shaping up rather nicely, after all. 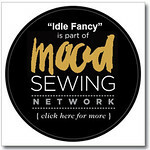 Note: The fabric for this project was given to me by Mood Fabrics free of charge, as part of my participation in the Mood Sewing Network. I picked it out, however, and all opinions are my own.